Undoubtedly, there are all sorts of weather conditions that can damage your roof. From snow and ice to wind and rain, your roof is susceptible to sustaining damage in almost any weather. That includes hail. Your roof can certainly be damaged during a hailstorm. Here are some ways a hailstorm can take a toll on your roof if you’re not careful. It can cause heavy winds to blow your shingles off. During a hailstorm, the winds will usually start whipping around. The winds will be blowing incredibly hard in one direction before then changing direction in an instant and blowing incredibly hard in that direction. All that wind can cause the shingles from your roof to blow off if they get violent enough. That means that, even if you end up avoiding most of the hailstones during a hailstorm, the wind alone can leave you dealing with damage. It can send large hailstones raining down on your roof and dent or crack shingles. Hailstones can really range in size. There are some that are as tiny as peas. There are others that are as large as softballs. The smaller hailstones might not have much of an effect on your roof, especially if they only fall for a short amount of time. But larger hailstones can dent or even crack the shingles on your roof, regardless of whether they’re made from asphalt, wood, or something else. You should always inspect your roof for signs of this kind of damage following a hailstorm. It can cause granules from your roof to fall off and land in your gutters. Unless a hailstorm gets really bad, you will usually be able to escape catastrophic damage to your roof. But hailstones can cause some subtle damage that might hurt your roof over the long haul. Hailstorms can knock the granules from your asphalt shingles off and send them streaming down into your gutters. This could clog your gutters, and it could also make your shingles weak and brittle. Either way, you should keep an eye out for damage like this due to a hailstorm. 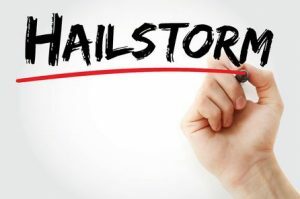 Was your roof recently damaged during a hailstorm? Roofing by Bruce can help you make the necessary repairs to it right away to prevent problems from getting worse. Call us at 570-424-8891 today to schedule roof repair.